Our vision is that organizations of all sizes have the help they need to work sustainably and effectively towards making the world a better place. 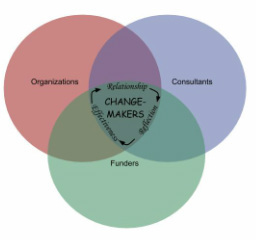 Our mission is to bring together organizations, consultants, and funders in the greater Madison area to build capacity for social justice, social change, advocacy, and community building work. We believe that connecting the right people with the right resources at the right time can make the right difference. Specifically, we believe that skilled, respectful, and appropriate support from capacity building providers can strengthen individuals and organizations. Organizational leaders, donors and funders value capacity building as a crucial catalyst and the most high-leverage place to invest for long-term impact. We believe this unique holistic approach to capacity building is an essential component of a vital, resilient, sustainable and effective network of people and organizations committed to making the world a better place. We aspire to change the system by which the people working to make our community better get the help they deserve, to make their work as sustainable and as effective as possible. We believe that changing how a system works happens by changing how its components relate to one another. How will we know we’re making a difference? Ultimately we want to know: Can we improve the way people and organizations connect with each other to boost capacity for making the world a better place? We say we can. We’ll know we’re on the right track if participants are benefiting from our central tenet — that cultivating relationships and facilitating reflection contribute to increased effectiveness, sustainability and joy in our work. CORE is an emerging entity. As with any "work in progress," we can't be sure where we'll end up. That's part of the fun! One vision of where we'd like to head is depicted at the right. 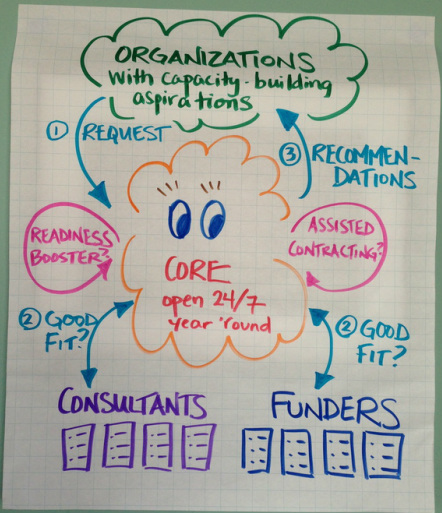 With Round 2 of our match-making program, CORE is already moving towards creating an "enduring portfolio" of consultants. We are also building more relationships with funders who care about capacity building, with the idea that we might help with "match-making" in this arena as well.